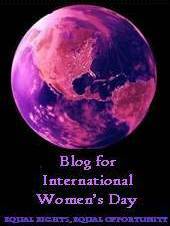 I encourage you today to check out Gender Across Border’s Blog(swarm) for International Women’s Day. Throughout the day, the GAB editorial board (including Emily Heroy, Colleen Hodgetts, Jessica Mack, Carrie Polansky, Erin Rickard, Elizabeth Switaj and Tatiana McKinney) will be updating GAB to highlight particular posts. It’s never too late to participate! Describe a particular organization, person, or moment in history that helped to mobilize a meaningful change in equal rights for all. I think it’s fairly clear that I admire Helen Keller, and resent the way what she did with her life has been reduced to parody, the subject of infantile jokes about people who are Deaf-Blind, and forgotten about. When people bother to tell bits of her story, about her learning words at a well after weeks of patient tutoring from Anne Sullivan, it becomes a form of Inspiration that’s based entirely on pity. Oh, how tragic her life could have been, shrouded in darkness and silence. And then she learned to speak! And all was well! I think Helen Keller changed the world, or at least did an awful lot of work towards changing it. But, even with focusing on her achievements, on her work, it’s important to put her in context. Helen Keller was a white middle-class woman from the US. She was young and pretty and very talented. Before she became famous as The Deaf-Blind Girl (because, of course, there can only be one Deaf-Blind Girl, and she is always white), Laura Bridgman was The Deaf-Blind Girl. And Bridgman was not as pretty, not as nice, and not as accomplished as Keller. I mention Laura Bridgman because, if the whole purpose of the Helen Keller Narrative was Nice Deaf-Blind Girl Does Good (and thus you, gentle reader, should put your life in proper perspective! ), then Bridgman fits almost the same bill. She learned to read and write, wrote letters to her fans, was on public display with ribbons to hide her eyes, and was just as famous as Keller. So why is our dominant narrative Keller and not Bridgman? Well, what better way to discount someone’s radical roots than to turn them into an Inspiring Story, and nothing more? So, for International Women’s Day, I want to remind readers that there are certain stories that we tell about certain women, and that these stories have a purpose. Perhaps we can subvert that. One of the fastest ways to make women with disabilities seem pathetic and worthless is to erase or ignore their lives. Why should the Feminist movement celebrate women like Helen Keller, when everyone knows that Keller’s entire contribution was she learned how to talk – and that was entirely Anne Sullivan’s work, after all. This is, of course, completely untrue [1. Well, not the bit about the water, but that it’s the sum total of Keller’s accomplishments], but there was a concentrated effort to ensure that Keller’s accomplishments were ignored. “Radical Marxist” isn’t as nice a story as “deaf-blind woman overcomes”. The only blind person who is given any voice or agency within the work [Ishbel Ross’ Journey Into Light: The Story of the Education of the Blind] is Helen Keller, who wrote the forward for the book, and is presented as “[rising] above her triple handicap to become one of the best-known characters in the modern world.” … [D]espite dedicating a whole chapter to Keller, Ross makes no mention of Keller’s politics or activism, instead describing Keller’s grace, “agelessness”, and book collection. No mention of her membership in the Wobblies [1. Industrial Workers of the World. They’re still around.]. I guess that didn’t fit the narrative. When we talk about Women’s History – and I understand Women’s History month is in March in the US[1. It’s October in Canada. ], so that’s not too long from now – we are doing something wrong if we do not include the lives of women with disabilities. Helen Keller isn’t the only woman with disabilities who has been ignored, erased, or sanitized for public consumption – it happens over and over, to queer women, to women of colour, to women who are ‘marked’ as ‘not-mainstream’. I think we can do better than this. I think we’re brave enough to not only confront that important women of our past participated in and encouraged others to participate in abuse, neglect, genocide of certain groups of women, but also brave enough to celebrate histories outside the mainstream. My pet hate: “Crip Drag”. Crip Drag is when a character has a disability, but the actor playing that character doesn’t have whatever disability they are portraying. Recent examples that come to mind are Kevin McHale, who plays Artie on Glee, any wheelchair-using villain you see in Doctor Who, and whoever got the role of Eleanor Perry in the Stargate: Universe episode “Sabotage”. When pushed on issues of Crip Drag, the creators of these shows and movies often respond in one of two ways. First, the character has the Miracle Cure Plotline, and thus they can’t have an actor with an actual disability play that role. At first I didn’t question this much, beyond my general irritation with the Miracle Cure Plotline (Hey, television and movie producers: We have more stories than that, thanks), but I’m beginning to be very irritated with that idea the more I think about it. Amongst other things, there are wheelchair users who can (gasp!) walk. They may walk with a cane, or some other assistive device, but as long as you’re not asking them to climb several flights of stairs and then go for a run, they’ll probably be able to manage enough to satisfy the “It’s a miracle, he can walk!” plotline. I suspect blind actresses could act like they could see for the sake of a storyline, too. * It’s almost like they can learn to act like they can see, the way another actress can learn to act “blind”. The second reason, the one that’s got me all irritated today, is the wonderful excuse that all minority groups get when they point out casting disparities: There aren’t any Big Names that will Bring In The Money who have disabilities, and Do You Know How Hard It Is To Find An Actor Who Could Do This Role At All? The latest in a long line of insults of this nature is the casting of Abigail Breslin as Helen Keller in the upcoming Broadway production of The Miracle Worker. For his part, the show’s producer, David Richenthal, claims that the production was unable to find a blind or deaf child actor with the star power to bring in enough of an audience to justify the show’s large budget, saying “It’s simply naïve to think that in this day and age, you’ll be able to sell tickets to a play revival solely on the potential of the production to be a great show or on the potential for an unknown actress to give a breakthrough performance,” he said. “I would consider it financially irresponsible to approach a major revival without making a serious effort to get a star.” The show will, however, be making an effort to find a blind or deaf actress to play Breslin’s understudy — but they won’t make any promises. Gosh, I wonder why there aren’t any Big Name Child Actresses who are d/Deaf or blind (or both) and can thus play Helen Keller. Do you think it’s because there aren’t enough roles that are given to such actresses so they can develop a name for themselves? Do you think it’s because any roles that could be given to a d/Deaf or blind actress are given to non-disabled actresses? Do you think there might be some sort of bias going on in casting decisions that might be impacting this at all? I sympathise a bit with the situation Richenthal is in. All he’s trying to do is make sure that an expensive production makes money, and Breslin has the star-draw. Apparently there are no other roles in The Miracle Worker that one could cast a name-drawing star in, and of course it’s foolish for anyone to think that the role of Helen Keller would go to an actress with a disability! What nonsense! This is, of course, a self-perpetuating system. Disabled people are not cast in roles that would demonstrate their acting talent. They do not get the experience and the face time that the currently non-disabled do, so they can’t increase their name recognition. Then, when a role comes up that is perfect for a person with a disability, the role goes to someone else, because people don’t have a clue who this disabled person is. The biggest actress, of course, who disproves this rule is Marlee Matlin. However, as much as I respect Marlee Matlin she is not the only actress in all of North America who is deaf. Honestly, I promise, lots of d/Deaf people do act. So do lots of blind people. My husband, who is a full-time wheelchair user, used to do Shakespeare. We are out here, and we are looking for paying gigs just as much as the next person. Stop the Crip Drag. Stop the Miracle Cure Plotlines. And stop acting like it’s just a wild coincidence that you don’t know of any disabled actresses with the star power to bring in the money for the role of Helen Keller. It irritates me. Please note: As with all of my posts, my schedule is such that I won’t be able to see comments for hours after you make them. My co-moderators will be approving most comments as they become aware of them, and will try and respond to any and all of them when I’m free. * I’ve described wheelchair users as male and blind people as female because this is how they are typically cast in North American shows.